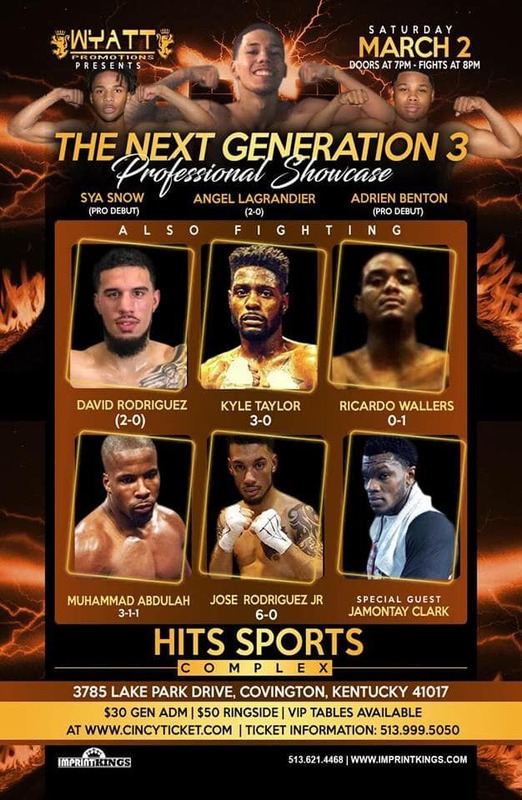 Cincinnati (January 31, 2019) Wyatt Promotions are back in action on Saturday, March 2, 2019 with a stacked show, showcasing top promising Pro boxers, as well as Pro debuts. If you missed the last action packed card back at Wyatt Arena, you don’t want to miss The Next Generation 3. Undefeated Cincinnati Featherweight Angel LaGrandier (2-0) will be a headliner, this is a kid to watch and he never disappoints. Rounding out the pro card will be Welterweight Kyle Taylor (3-0, 3 KOs), Heavyweight Muhammad Abdullah (3-1-1, 1 KO), Heavyweight Ricardo Wallers (0-1), and the Rodriguez brothers Super Lightweight David (2-0) and Middleweight Jose Jr. (6-0). Another exciting segment on this card is the future of the sport, the pro debuts, featuring National Golden Gloves qualifier Sya Snow and National Golden Glove Gold Medalist and Golden Boy Award recipient Adrian AJ Benton. Come out and see the future landscape of Cincinnati and Ohio boxing. Also in attendance will be special guest Super Welterweight Jamontay Clark. And you never know what other top Pro and Olympian talent will be in the building to support the next wave of professional fighters. This action packed night will take place at Hits Arena & Sports Complex, located at 3785 Lake Park Dr. Covington, Kentucky 41017. Doors open at 7 pm, first bell at 8 pm and bouts subject to change. Ticket prices are $30, $50 for ringside (VIP Booths/Tables/Ringside available) and are on sale now; call Wyatt Promotions at (513)999-5050, or visit online at CincyTicket. For more information visit: www.wyattpromotions.com.